This entry was posted in Economics for the Jilted Generation, International Relations and tagged angela merkel, BBC, eurozone, external debt, ken rogoff. Bookmark the permalink. How do nations default, exactly? Is it only through debt-forgiveness, war and/or high inflation? Germany’s Weimar republic defaulted on its oligations under the Treaty Of Versailles, and the French occupied the Ruhr Valley. 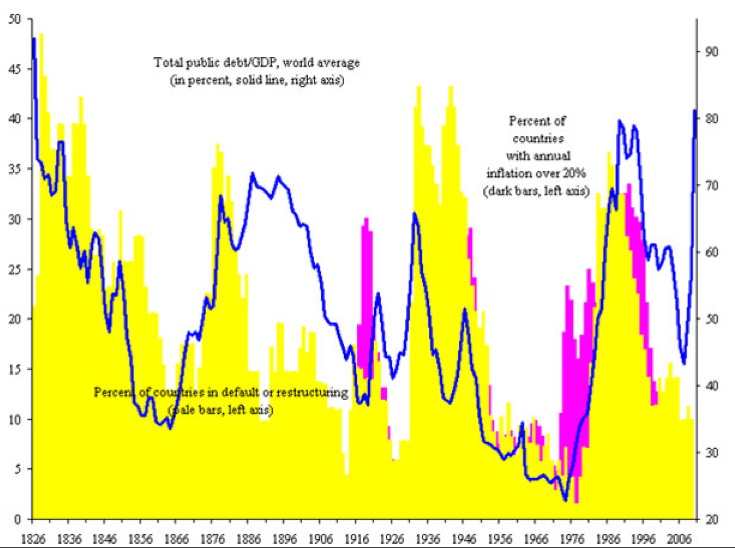 Why would’t a Creditor nation occupy a debtor nation? This implies that to avoid war, debt must be forgiven. If debt is forgiven by compulsion through threat of sanctions e.g. UN saying to China, sorry your are not to be repaid; would China lend in future? How will governments finance their deficits? I am sorry, but I am in Cash and Farm land assets untill I can see a way out of this mess. Hmm interesting. So out of all the major Sovereign defaults through history, how many involved a transfer of land, I wonder. Buddy, you bought farm land? Very wise decision sir. Defaults do very often result in the creditor physically retaliating to take their pound of flesh. Germany may some day occupy the Parthenon. Debt forgiveness is a very Christian concept, and many of the concepts of Christianity are hopelessly progressive and radical. Infinitely more interesting is the prospect of China seeking a pound of America’s flesh. With the world’s greatest debtor nation also the most armed, this entire situation is extremely risky. That’s interesting about debt forgiveness and Christianity. Hmm, I see that the US’s 2 largest creditors (besides its own citizens) are China and Japan. Bummer for the US. What I mean is, lets say the French States owes 100 billion euros to Italian citizens. And the Italian State owes 100 billion to French citizens. The debts could be swapped, so that the French State can surrender some of its public land to its own French citizens as a default solution. And the Italian State can surrender some of its public land to its own Italian citizens as a default solution. Since much of the debts seems to be between EU States, this surrender of public land to its citizens would be more palatable than surrendering public land and/or stock in privatized industry to citizens of *another* nation. (Of course, debts are not equal, but to the point that they are this could occur… so its only a start). The same can’t be said for US and its creditors/debtors. Then again, what debtors? So, not only does the US have no debt to swap, but it is not neighbors or historically linked with its creditors, so I don’t see there being room for such creative solutions. Let’s just say that in 30 years time I would be surprised if many titans of US industry (Apple in particular) are not owned by the Chinese state. I personally believe that America would induce China to start a proxy war, lose it, and forgive American debt as an obligation for the war – just like what they did in the Versailles Treaty after WWI. (A war on the Korean Peninsula seems likely, although China knows it can’t win a war against S Korea, Japan and the US troops there combined. A proxy war at Iran or Pakistan would also be feasible.) If this scenario comes true it would be interesting to watch whether China gets into America’s trap and start a war or not. We shall see. China’s wild card is that it seems a whole lot of recent American military hardware was manufactured in China. The drone incident seems to suggest Iran were given a back door, hacked into the drone and landed it. If America has to discard most military hardware it has added since the mid-1990s, they will struggle, wherever the front is. Iran and Pakistan are the likeliest locations. I believe more people need to read blogs like this. Its so essential to know how to construct a fantastic blog to get people interested and youve done just that. The content is fantastic, the videos are ideal for what youre trying to say. Awesome, man. Genuinely awesome! Cant wait to read far more.